AMABILE V. GALEA and HELEN ELLUL. On January 11, 1959, at St Aloysius College private chapel, Canon Lewis Ellul Bezzina, the bride’s brother, officiating. May the Lord bless you both. Best wishes and love from Patrick and Marthese, Bernard and Alessandra, Gabriel and Chloe. ABELA. On Sunday, January 6, at Mater Dei Hospital, MARIA ELENA (Mariella), née Refalo, went to meet the Risen Lord, comforted by the rites of Holy Church. She leaves to mourn her great loss, her beloved daughters Jocelyne and Caroline and her husband Andrew Magri Overend, her grandchildren Michael and Dominique, Nadine and Tomaz, Amanda and James, Fiona, Lisa and Luke, her sisters-in-law, Anne Refalo and Margaret Borg, her nephews Fr Gordon Refalo, Ian and Hazel Refalo, her dear cousins, other relatives and friends. 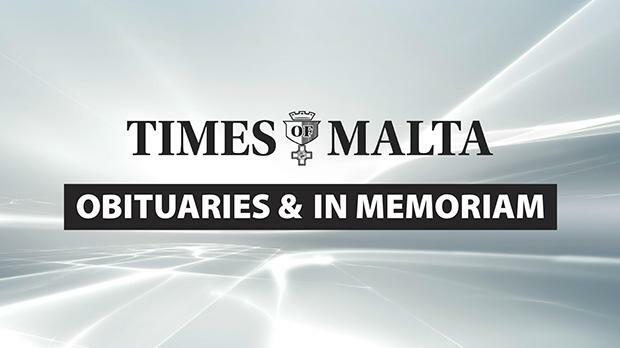 The funeral leaves Mater Dei Hospital today, Friday, January 11, at 1.30pm, for Stella Maris parish church, Sliema, where Mass præsente cadavere will be said at 2pm, followed by interment at Santa Maria Addolorata Cemetery. Lord, grant her eternal rest. DEBONO. On January 9, at Karin Grech Rehabilitation Hospital, ANTON, aged 92, passed away peacefully comforted by the rites of Holy Church. He leaves to mourn his loss his beloved wife Mariuccia, née Gauci Borda, his children Maria, wife of Albert Zammit, Noel and Christine Attard, Therese, wife of James Scerri, Cynthia, wife of David Calleja, Christopher, John and his wife Larissa Ivanova and Bernard and his wife Sharon Cassar, his many grandchildren and great-grandchildren, in-laws, other relatives and friends. The funeral cortège leaves Mater Dei Hospital tomorrow, Saturday, January 12, at 8am, for Santa Maria parish church (Knisja l-Qadima), Birkirkara, where Mass præsente cadavere will be said at 8.30am, followed by interment in the family grave at Santa Maria Addolorata Cemetery. Donations to id-Dar tal-Providenza, Siġġiewi, being his favourite charity, will be greatly appreciated. Lord, grant him eternal rest. MUSCAT. On january 10, at Villa M.SS.ma Annunziata, Balzan, Sr CECILIA of the Sisters of Charity, aged 98, passed away peacefully to meet the Risen Lord. She leaves to mourn her loss the congregation of the Sisters of Charity, her brother Albert, nephews, nieces and other relatives and friends. Mass præsente cadavere will be celebrated today at 9am at the chapel of the convent of the Sisters of Charity, 55, Birbal Street, Balzan, followed by interment at Santa Maria Addolorata Cemetery. Lord, grant her eternal rest. A trigesima die Mass for the repose of the soul of VIVIENNE GAUCI will be celebrated on Sunday, January 13, at 10.30am at Stella Maris parish church, Sliema. The attendance of relatives and friends will be appreciated. Lord, grant her eternal rest. BARTOLO – JOANNE, née Camilleri. Cherished memories of a beloved daughter, today the 11th anniversary of her demise. Your parents Carmen and Crispin, your husband Ivan and daughters Jessica and Ally, your brother Daniel, his wife Vanessa and their children, in-laws Charlie and Lina and all relatives and friends. BEACOM – Major PATRICK BEACOM. In ever loving memory of our dearest Paddy, a wonderful husband, father and grandfather, whose fifth anniversary of his passing falls on 15.1.’19. Dearly missed by his wife Antoinette Vassallo Gatt, his sons Patrick and wife Tanya, Jonathan and wife Glorya, and Andrew; grandchildren Chloe, Rebecca, Julia, Julian and George; his sister Victoria Dedomenico and her sons Simon and Jonathan; in-laws, nephews and nieces, their spouses, extended family and friends. A Mass for the repose of his soul will be said this Sunday, January 13, at 11.30am, at Our Lady Mother of Good Counsel church, Paceville. You’re always with us in our thoughts and prayers dad, so hard to believe it’s already five years. CAMILLERI. In loving memory of JOSEPH, a dear husband, father and grandfather, today being the first anniversary of his demise. Forever in our hearts and always in our prayers. Deeply missed by Adeline, Caroline, Moira and Mark, Ruth and Steve and his loving grandchildren Neil, Nina and Michelle. Lord, grant him eternal rest. CARUANA GALIZIA – MARY, née Lupi. Lovingly remembered by all her family on the 19th anniversary of her death. Lord, grant her eternal rest. GLANVILLE. In memory of our dear mother MARIA, today the anniversary of her demise. Always in our thoughts and prayers. Her children Lina, Bernadette and Joe. PACE. In ever loving memory of NORMAN, a dear brother and uncle, today being the first anniversary of his demise. “To live in the hearts of those we love is never to die.” Massie, Martina, Marco and Harry. PACE – NORMAN. On the first anniversary of his parting from this life. Always remembered by his sister Mona and her children. Lord, grant him eternal rest. PACE – NORMAN. Remembering my brother today his first anniversary. Gone but not forgotten. Rest in peace. Gloria and Joe. PACE – NORMAN. Fond memories of my dear brother today and always. May he rest in peace. Rosanne and her children. ZAMMIT TABONA. In ever loving memory of our dearest MAURICE, a wonderful husband, father and grand­father, on the 21st anniversary of his passing. So sadly missed by his family. A Mass for the repose of his soul shall be said today at 6.30pm at Tal-Ibraġ parish church.